The HSS is currently developing a Lower Peirce Guided Walk to open to the public. To plan a proper route and to identify key checkpoints, we organised a recce trip to the Lower Peirce Boardwalk on the 24th of May. Jonathan Tan (JT) from Youth for Ecology expressed interest in joining us for this walk, so we invited him along too! So, JT, Almira, Ing Sind and I met up at Casuarina Curry to have the obligatory teh tarik (just for luck). Once that was settled, we set off onto the boardwalk. Almost immediately, Jonathan spotted the first herp of the day. It was a Black-bearde d Gliding Lizard (Draco melanopogon). JT saw it glide right in front of him, after which it scurried up the tree. This was JT’s first time seeing a Gliding Lizard. Congratulations! On the picture on the left, see if you can spot the long dewlap that gives the Black-bearded Gliding Lizard its name. Psyched up by the early herp appearance, we walked on. There was a section of the boardwalk that ran parallel to a stream. As we looked down, we didn’t re ally see anything. Suddenly, a splashing sound was heard from the stream. “OH!”, JT and Ing Sind shouted at the same time. And then we saw what they were pointing at. The endangered Malayan Brown Snake¹ (Xenelaphis hexagonotus). It had adopted its signature ‘tripod’ pose, with the head and neck sticking out of the water’s surface. This is the typical position that the Malayan Brown Snake adopts while hunting prey (usually fish and small frogs). The snake then proceeded to patrol the stream, presumably searching for food. We informed the rest of the team about the snake. 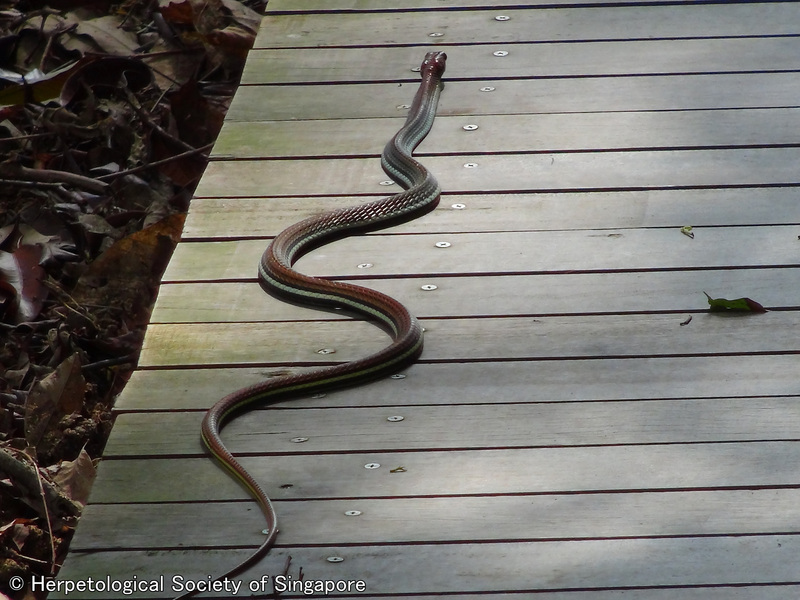 Serin got so excited, he took a taxi all the way from Tampines to see this snake! That’s dedication. Half an hour later, we saw him lumbering down the boardwalk, covered in sweat. Happily, the snake was still patrolling the stream. Serin even managed to get a video of this truly fascinating behaviour. You can view it at http://tinyurl.com/Xhexagonotus. To add to all the excitement, ANOTHER Malayan Brown Snake showed up. We noticed that the two serpents were swimming past each other from opposite ends of the stream, even chasing away a nearby snakehead(Channa sp.). It is possible that this is actually an example of co-operative hunting, which is not commonly observed in snakes! I got a notification on my phone from Joelle (from the NUS Toddycats),saying that she was doing Operation No Release at Lower Peirce Reservoir. Excited, we hurried over to the other end of the boardwalk, where we met Joelle. While sh e did not see anybody releasing anything into the reservoir, she did find out that many people were unaware of the ecological harm that releasing animals into the wild can cause. In fact, shortly after that, we actually found an American Bullfrog (Lithobates catesbeiana) sitting on the rocks at the fishing grounds. Closer inspection revealed that the left leg of the frog was severely damaged, possibly due to a predatory attack. These non-native frogs are often released (along with several other types of animals) into ponds and reservoirs as a way of receiving religious merit, or good karma. However, these frogs may out-compete local amphibian species. Such acts do more harm than good to ecosystems and even to the animals that are released, as this particular frog illustrates. On the way back, we met a boy named Ethan, who was walking with his father, Eugene. Young Ethan was very excited to join us on the final leg of the walk. We were worried that all the herps would have gone into hiding, but we managed to find a juvenile Green Crested Lizard (Bronchocela cristatella) for him to see. Eugene had to carry Ethan to get a better look at this pretty lizard! In this day and age, a Singapore without Lower Peirce Reservoir may be hard to imagine. Yet, that was almost the case in 1992, when a 120 hectare plot of land in the reservoir was proposed to be turned into a golf course! A large public outcry caused the proposal to be abandoned, certainly for the better. As we have seen, Lower Peirce is home to many rare organisms (not just the herps). As long as the public appreciates this green space and takes proper care of it, we will be able to keep it for many more years to come. To end off, here is a beautiful panorama of the Reservoir, taken by Almira. Having a special permit to study the herptiles of the Mandai area, we were stoked to check the area out. We arrived at Mandai with high expectations and uncontrollable anticipation. The night air carried a vibe of a solid night awaiting us. We encountered a roadkill juvenile Malayan Racer (Coelognathus flavolineatus), which was collected to be sent over to the museum. We than heard an unusual call coming from a grove of trees. Suddenly the Greater racquet-tailed Drongos (Dicrurus paradiseus) start calling harshly and divebombing a large bird. 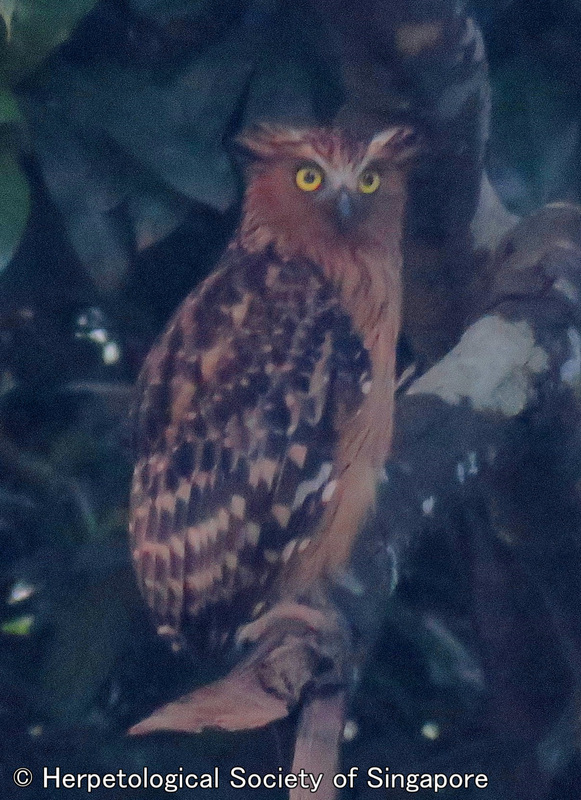 It was a Buffy Fish Owl (Bubo ketupu) and he was not alone, he had a partner! Buffy Fish Owls are one of the largest resident owls in Singapore and it is an awesome hunter. This handsome predator has even been recorded taking on a Shore Pit Viper (Cryptelytrops pupureomaculatus). We continued on after this amazing encounter with these rare birds. We came upon a small stream where we found two species of frogs. Malayan Giant Frog (Limnonectes blythii) on the bottom left and a Black-eyed Litter Frog (Leptobrachium nigrops) on the bottom right. The Black-eyed Litter Frog was calling the night air was filled with the calls of at least 10 different individuals. The Malayan Giant is a massive frog and it has been seen clearing more than 2 metres in a single bound. 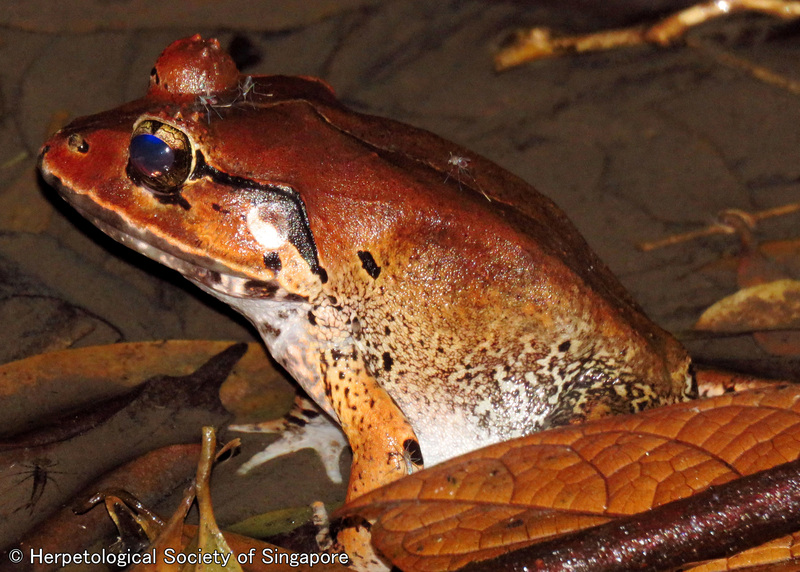 The Malayan Giant is also one of only 9 species of amphibians that occur outside the nature reserves. We strove on hoping to encounter a snake. Ing Sind’s keen eyes picked out a flying squirrel (Most likely Iomys horsfieldi) at the top branches of a tall tree. As I rounded a tree to get a better view i came face to face with a sleeping Striped Bronzeback (Dendrelaphis caudolineatus). It was a massive individual, well over a meter and was quite robust. Its beauty was resounding and even though it is deemed a common snake, its beauty made us pause to gaze at its vibrant colouration. The Striped Bronzeback is one of 6 species of Bronzebacks in Singapore. Both this species and its cousin the Painted Bronzeback (Dendrelaphis pictus) are the only Bronzebacks that occur outside proper forest and can be found in grassland and suburban woodland habitat. 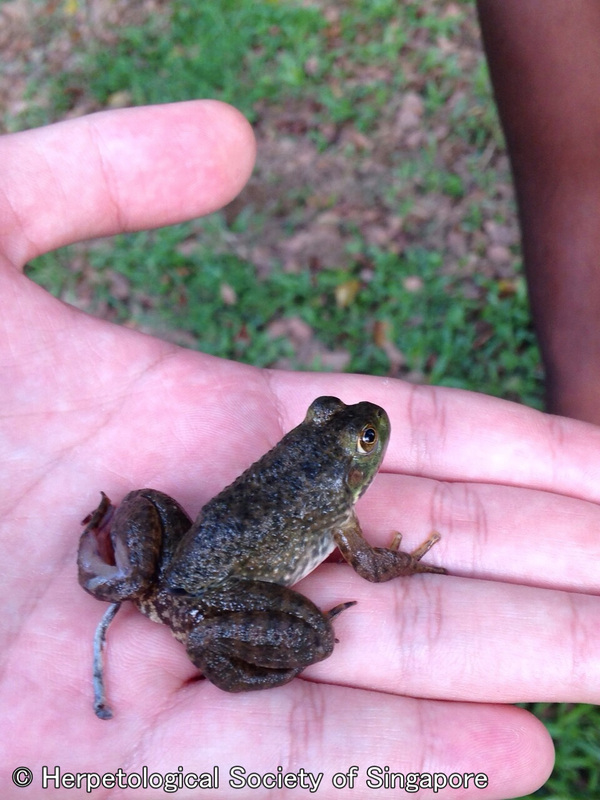 We then trekked to a different part of Mandai where we came across 3 more species of amphibians. The first two were a Malesian Frog (Limnonectus malesianus) and a Copper-cheeked Frog (Hylarana labialis). The Malesian Frog (left) is often mistaken for a Malayan Giant Frog due the similar size and coloration, however the key feature that separates the Malesian is a prominent ‘W’ on the back of the neck. The Copper-cheeked Frog (below) can often be found perched low on branches that are nearby streams. They have calls that sound much like the sound of dripping water! We pushed on a little further to try our luck and we were rewarded with an uncommon Golden-eared Rough-sided Frog (Pulchrana baramica). This little frog is stunning in both features and colouration. It was also a lifer for Sankar! 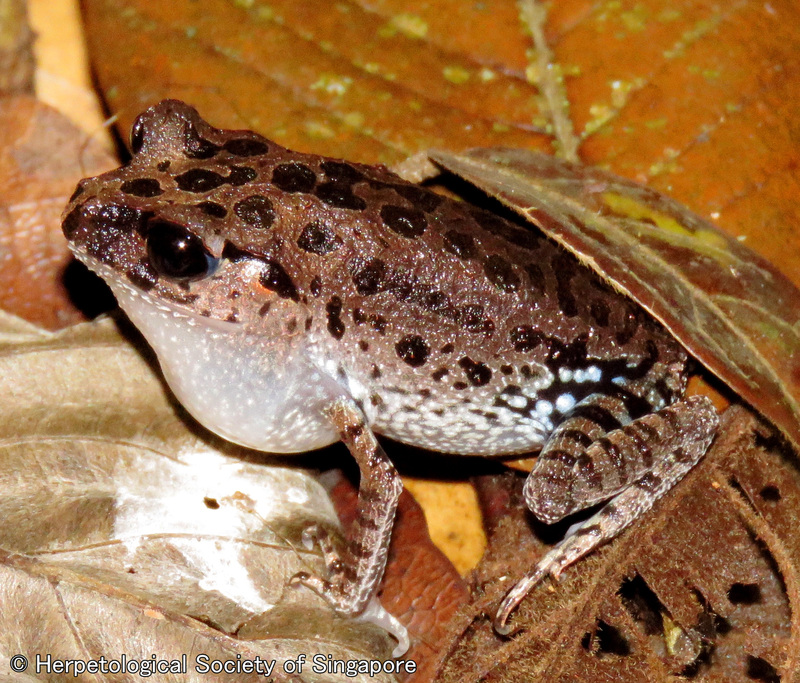 This frog is uncommon to moderately rare is Singapore as it is restricted in its range. Thoroughly satisfied, we called it a night and left extremely happy and eager for our next herping adventure. I hadn’t seen a snake all week and my arms were itching. It was high time to go herping. Sadly, nobody was free to herp with me. So I decided to go solo. On the bus to Lower Peirce , it dawned on me that it was my first time going to the Central Catchment Nature Reserve by myself. As I walked in, I texted the group that I was in Lower Peirce. They bade me good luck and told me to call them down if I saw something cool. And I reassured them that I would. It was an interesting experience, to say the least. Since it was a Tuesday afternoon, there was literally nobody at the reserve. The canopy cover provided much needed respite from the blazing afternoon sun. There was a good wind blowing across the water. I was also happy to see that there was nobody releasing animals into the reservoir! As I ventured in, I heard several sounds. A Woodpecker pecking on wood in the distance, a Greater Racket Tailed D rongo (Dicrurus paradiseus) making a metallic call and a Plantain Squirrel (Callosciurus notatus) squeaking nearby. Usually, the starting area is a great place to find Black-bearded Flying Lizards (Draco melanopogon). Sadly, I saw none. I did, however, see several birds, including an Orange Bellied Flowerpecker (Dicaeum trigonostigma) eating the fruits of the Senduduk (Melastoma malabathricum) and a Drongo bathing in the reservoir. The first herp of the day turned out to be a gorgeous Clouded Monitor Lizard (Varanus nebulosus). It was foraging, flicking out its tongue and digging around in the leaf litter in search of food. It seemed not to mind my presence and went about its business. As I headed on, I met a jogger. I asked him if he had seen anything. He told me that there was a group of Wild Boars (Sus scrofa) up ahead. I took my time to walk up to the end of the trail. Sure enough, a large family of Wild Boars were wandering around. The mother was followed closely by her piglets, which resemble brown watermelons. I reached the end of the trail, disappointed at the low herp count. I was about to head off, when I was hit by a craving for Teh Tarik. I decided to turn around and head to the prata shop at the other side. I had barely taken 3 steps in the other direction, when I was greeted with this sight. A large Striped Bronzeback (Dendrelaphis caudolineatus) had slithered up onto the boardwalk behind me to bask in the sun. It was interesting to see the flattening of the body to increase the exposed surface area. This harmless snake generally eats frogs and lizards. This snake is distinguished from other bronzebacks by the thin black stripes on its body. The dorsal scales are reddish-brown. Interestingly, this bronzeback has a very weak eyestripe, which can be found in most of the other bronzebacks. As I approached it, the snake slithered away into the undergrowth and climbed up into the trees, out of sight. Satisfied, I rushed to the prata shop (it was threatening to rain) to get some well deserved teh tarik. Jagah [jah-gah] (v) : To guard, take care of. Picture courtesy of Joelle from the Toddycats! Becky, Ing Sind and I signed up to do Jagah duty at Bukit Timah Nature Reserve on the 26th of April 2015. We turned up at Hindhede Road at 2pm to get briefed. We were, of course excited about the job at hand. But we were also nervous. Trying to look confident, we climbed the hill. With us, were Joelle and Kai Scene from the Toddycats! Ing Sind, Joelle and I stayed on the summit to guard against illegal entry and to advise the public about appropriate behaviour when dealing with the resident macaques. Becky and Kai Scene were stationed at the foot of the summit. We spent a few uneventful hours there. All the visitors were very co-operative and friendly! There were no incidents with the macaques either. At the end of the first half of our shift, Becky, Ing Sind and I decided to patrol the foot of the summit to ensure no illegal activity. What followed was an hour of opportunistic herping. As we reached the foot of the stairs leading to the summit, I saw a Peninsular Rock Gecko (Cnemaspis peninsularis), with its tail coiled, sitting on a large tree trunk! Almost immediately after that, Ing Sind spotted a Five Banded Gliding Lizard (Draco quinquefasciatus) resting on a nearby tree with its patagium flared slightly. We took the opportunity to point it out to some passers-by. As we walked on, Ing Sind spotted a Brown Tree Skink (Dasia grisea) slowly climbing up the trunk of another tree. Despite its diurnal habits, this lizard is rarely seen. It is a resident of lowland secondary and primary forests. We proceeded with the patrol and found nothing suspicious. Becky then mentioned that Ing Sind and she had seen a Clouded Monitor (Varanus nebulosus) before I had arrived that day. 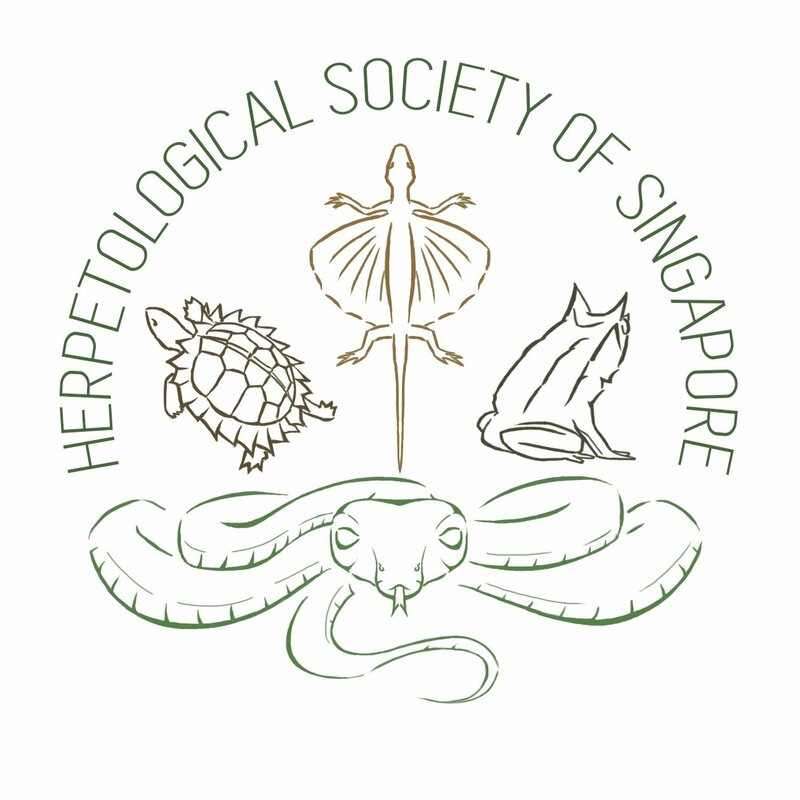 It dawned on us that we had seen representatives from the major lizard families that can be found in Singapore in a single day: Varanidae, Gekkonidae, Agamidae and Scincidae. Impressed with the day’s herp turnout, we turned back. It only got better. Back at the summit, we noticed a group of visitors pointing and taking pictures of something in the undergrowth. Intrigued, we ran over, only to see the tail of a Blue Bronzeback (Dendrelaphis cyanochloris) as it disappeared into the brush. At 5.30pm, we began the end of day duty to close the summit trail. As we walked down, we saw two visitors looking at a small plant next to the staircase. A closer look revealed it to be a juvenile Wagler’s Pit Viper (Tropidolaemus wagleri)! We were ecstatic! After admiring the viper for a while, we continued to the entrance, ensuring that all the visitors had left the reserve by 6pm. We saw 5 herps (3 of which are relatively rare) in an hour. I think that speaks volumes about the importance of maintaining the health of BTNR. It is a great place to jog and spend time with friends and family. But the reserve is also a home to a great diversity of living things (not just the herps). While certain spaces are closed for slope stabilisation and forest restoration, we should respect the opening hours and the designated boundaries. BTNR is for the animals AND for the people. Let’s keep it that way for as long as possible. Note: Since April 4, BTNR has been accessible to the public via Hindhede Nature Park from 7am-6pm on weekends only. The last admission to the reserve is at 5pm.